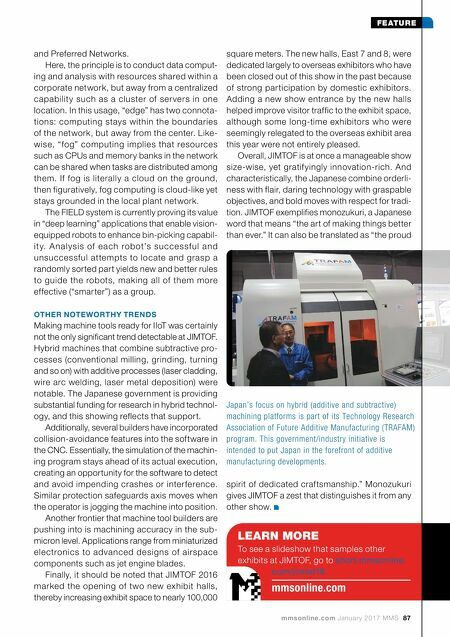 86 MMS January 2017 mmsonline.com FEATURE support of AMT—The Association For Manufactur- i n g Te c h n o l o g y, Ja p a n e s e b u i l d e r s to o k a n e a r l y i n te re s t i n M TC o n n e c t. M o s t n ot a b l y, Mazak Corp.'s North American manufacturing h e a d q u a r te r s i n F l o re n c e, Ke n tu c k y, m a d e MTConnect a major par t of its iSmar t Factor y concept. 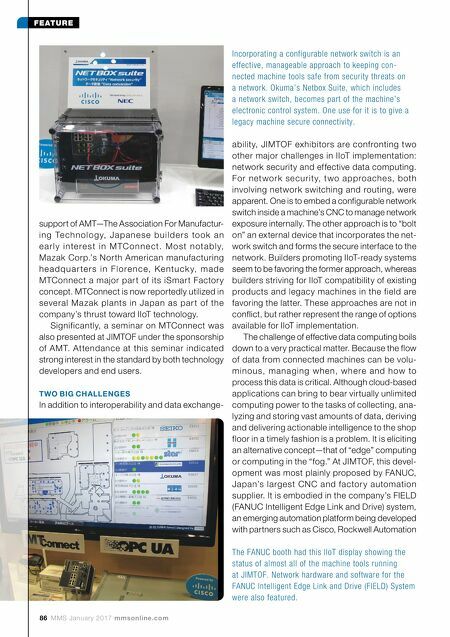 MTConnect is now reportedly utilized in several Ma zak plants in Japan as par t of the company's thrust toward IIoT technology. Significantly, a seminar on MTConnect was also presented at JIMTOF under the sponsorship of AMT. Attendance at this seminar indicated strong interest in the standard by both technology developers and end users. TWO BIG CHALLENGES In addition to interoperability and data exchange- ability, JIMTOF exhibitors are confronting two other major challenges in IIoT implementation: network security and effective data computing. For net work securit y, t wo approaches, both involving network switching and routing, were apparent. One is to embed a configurable network switch inside a machine's CNC to manage network exposure internally. The other approach is to "bolt on" an external device that incorporates the net- work switch and forms the secure interface to the network. Builders promoting IIoT-ready systems seem to be favoring the former approach, whereas builders striving for IIoT compatibility of existing products and legacy machines in the field are favoring the latter. These approaches are not in conflict, but rather represent the range of options available for IIoT implementation. The challenge of effective data computing boils down to a very practical matter. Because the flow of data from connected machines can be volu- minous, managing whe n, whe re and how to process this data is critical. Although cloud-based applications can bring to bear virtually unlimited computing power to the tasks of collecting, ana- lyzing and storing vast amounts of data, deriving and delivering actionable intelligence to the shop floor in a timely fashion is a problem. It is eliciting an alternative concept—that of "edge" computing or computing in the "fog." At JIMTOF, this devel- opment was most plainly proposed by FANUC, Japan's largest CNC and factor y automation supplier. It is embodied in the company's FIELD (FANUC Intelligent Edge Link and Drive) system, an emerging automation platform being developed with partners such as Cisco, Rockwell Automation Incorporating a configurable network switch is an effective, manageable approach to keeping con- nected machine tools safe from security threats on a network. Okuma's Netbox Suite, which includes a network switch, becomes part of the machine's electronic control system. One use for it is to give a legacy machine secure connectivity. The FANUC booth had this IIoT display showing the status of almost all of the machine tools running at JIMTOF. Network hardware and software for the FANUC Intelligent Edge Link and Drive (FIELD) System were also featured.